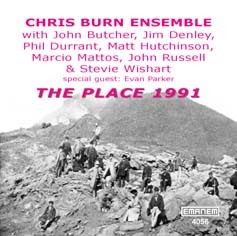 A concert performance by the eight-piece group, with JIM DENLEY (flutes), JOHN BUTCHER (saxophones), PHIL DURRANT (violin), STEVIE WISHART (violin & hurdy-gurdy), MARCIO MATTOS (cello), JOHN RUSSELL (guitar), MATT HUTCHINSON (synthesizer) and CHRIS BURN (piano & percussion). 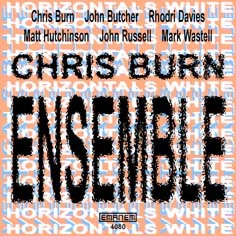 They interpret three scores by Burn, and one each by Butcher and Keith Rowe, as well as performing a free improvisation. EVAN PARKER is an added guest on one of the Burn pieces. 72 minutes - previously unissued. 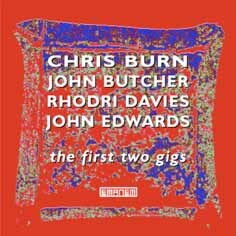 An improvising quartet featuring four of the finest and most innovative musicians, who have extended the ranges of their respective instruments - piano, saxophones, harp and double bass - into new, uncharted territories. As well as having exceptional techniques, they are all virtuoso listeners, so that these first two performances as a quartet sound as if they have being working together for years. 68 minutes. The whole of two totally improvised performances from London's Red Rose and Conway Hall with CHRIS BURN (piano & percussion), JOHN BUTCHER (soprano & tenor saxophones), MARK WASTELL (cello), JOHN RUSSELL (guitar) and MATT HUTCHINSON (synthesizer & electronics), plus RHODRI DAVIES (harp) at the Red Rose. A smaller Ensemble than on their three previous CDs, but sounding larger at times. 58 minutes.